In spite of all three movies and books being released and the trilogy being concluded, the Lord of the Rings remains as popular as it was years ago, when it was first released. It is a powerful tale about unlikely courage and good versus evil, utilizing masterful storytelling and well-developed characters to drive home its plot and its points. 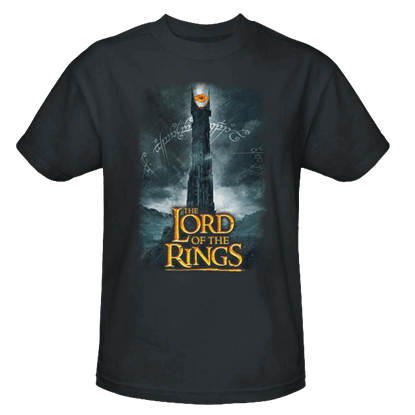 Here, we are no strangers to the LOTR craze, and we are happy to provide a number of attractive and comfortable garments, all found here in our Lord of the Rings T-Shirts section, for any LOTR fan to wear and enjoy, on any day of the week. These shirts come in a variety of colors and a variety of styles, featuring all manner of characters for any Lord of the Rings fan to enjoy. If you want to celebrate the heroes, we have shirts with Aragorn, Gimli, Legolas, Sam, and Frodo, as these prevalent characters take center stage. Or, if you prefer to pay homage to the trilogys fantastic villains, there shirts depicting the snarling faces of orcs and uruk hai, as well as shirts that show off the evil of dark lords like the Witch King, the fallen wizard Saruman, and even the Dark Lord Sauron himself. Some of the shirts are novel, featuring a touch of humor, while others feature quotes from the movie. 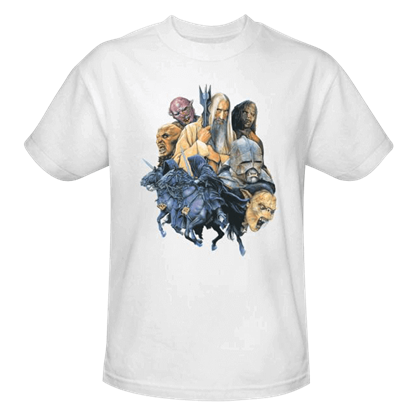 All of them, however, share in common their fantastic quality and their great level of comfort, which means whether you want to wear them day after day or just every once in a while, these Lord of the Rings T-Shirts are the perfect garment or gift for any LOTR trilogy fan. 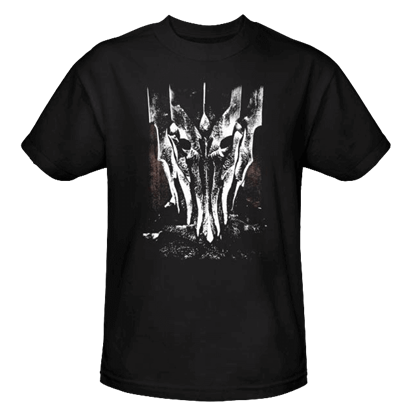 The Always Watching T-Shirt depicts the well-known form of the Dark Lord Sauron. As the All-Seeing Eye, Sauron could see all in his domain and more, as his gaze frequently turned upon wherever he felt his ring to be. 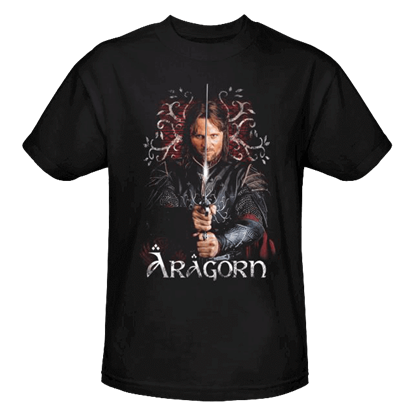 It is no surprise that this Aragorn T-Shirt depicts the ranger, Aragorn, although instead of ranger garb, he is depicted in the regalia befitting his lineage as Isildurs heir and his eventual position as the king of Gondor and Arnor. Daughter of Elrond and lover of Aragorn, Arwen Evenstar would eventually become Queen of Arnor and Gondor. 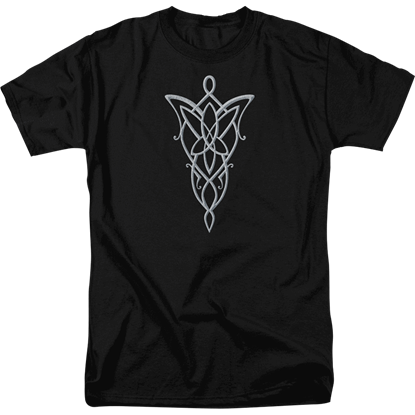 The Arwen Necklace T-Shirt may be simple in design, but it captures the brilliance of this characters beauty perfectly. Arwen Evenstar was the daughter of Elrond and the lover of Aragorn, who would become king of Gondor and Arnor. This Arwen T-Shirt features a portrait of this elven maiden, along with the sword she wielded in defense of her people. There is no forgetting the demon of darkness and flame that came out of the depths of Moria to haunt the fellowship as they fled from goblin hordes. 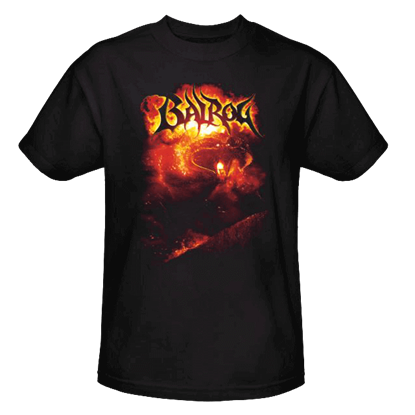 Known as Durins Bane, this dark creature is represented on this Balrog T-Shirt. The infamous form of the Dark Lord Sauron is the all-seeing eye of fire, as seen in the Lord of the Rings films. 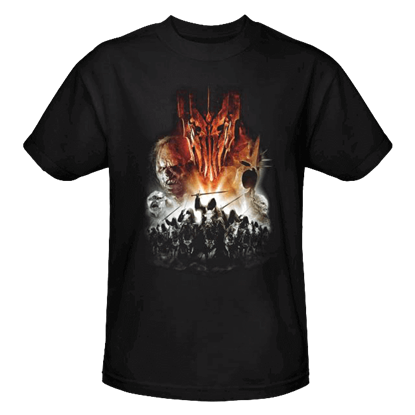 This is not his only form, though, with his most terrifying form depicted on this Big Sauron Head T-Shirt. Frodo was not the only remarkable hobbit. His uncle and caretaker, Bilbo, was an adventurous sort who, well before his nephew traveled abroad, had his own adventures. 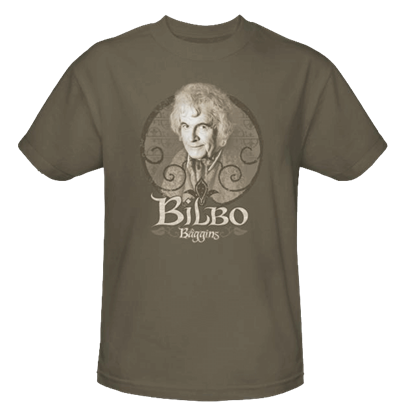 This Bilbo Baggins T-Shirt commemorates such a free-spirited hobbit. In a single moment of clumsy curiosity, the situation goes from good to bad for the Fellowship of the Ring. With a single comment Boromir, the situation gets even worse. 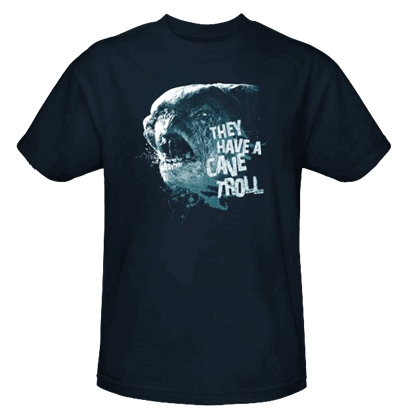 That comment is depicted here on this simple Cave Troll T-Shirt. Evil has many faces, especially in the lands of Middle Earth. On this Collage of Evil T-Shirt, you can see many gathered together, ranging from the feral glare of an orc to the cold stare of a wizard to the hollow gaze of a wraith. 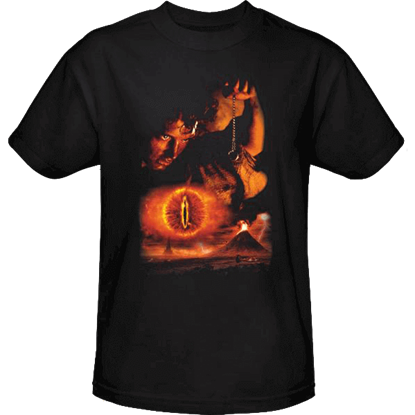 This Destroy The Ring T-Shirt depicts a pivotal moment in the Lord of the Rings trilogy, one that has been coming since Frodo first shouldered the burden of taking the ring to the fires of Mount Doom, where the ring was forged. It seems that evil is on the prowl. At least, it will whenever you wear this Evil Rising T-Shirt, which features an impressive gathering of the greatest villains from the world of Middle Earth. This t-shirt is a licensed Lord of the Rings product. 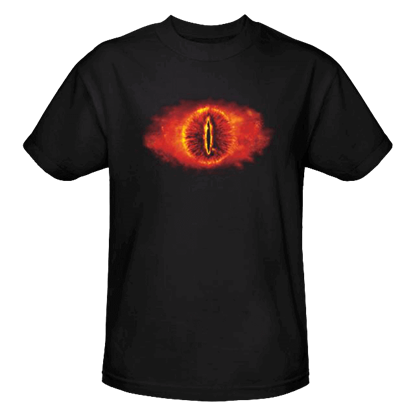 There is no need to have a palantir to catch a glimpse of the all-seeing Eye of the dark lord, especially when you are wearing this Eye Sauron T-Shirt, which casts the dark lords malicious and fiery glare wherever you might wander.